Nestled in the Village of Elora, Drew House offers a magical retreat from the pressures of everyday life. 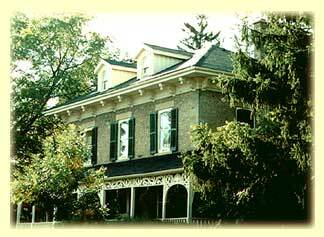 The childhood home of Ontario Premier George Drew, this enchanting bed and breakfast offers accommodation for couples, families and people traveling on business. Surrounded by tall trees, this charming nineteenth-century home and its renovated limestone coach house feature eight guest units. Drew House is the perfect setting for a peaceful night's stay. Built in 1850, Drew House is distinctive for its fine architectural details, including a wrap-around porch with hand-carved bric-a-brac trim. Cathedral windows and 18-inch limestone walls add a special character to the home and are carefully reflected in the design of the adjacent coach house. With lush green lawns and a sunny slate courtyard, the garden complete with more than 40 trees and its own fish pond, is a wonderful place for a leisurely stroll, quiet meditation, or an afternoon nap. Check out We Are What We Think and What We Eat, by Roger Dufau. Available at Drew House and at Amazon.com. Visit www.rogerdufaubooks.com for more information! © Copyright 2013-2016, Drew House, Elora, Ontario. All rights reserved.